Events across the country are taking place this week to create public awareness around saving money on energy bills. The Big Energy Saving Week is an initiative run by Citizens Advice, the Energy Saving Trust and the Department of Business, Energy and Industrial Strategy (BEIS) and its aim is to combat fuel poverty. The main focus of these events is to tell people about how much money they can save by switching energy supplier. According to the Energy Saving Trust , consumers who haven’t switched energy supplier in the last six years have lost out on £1,500. Making informed choices as consumers can not only lead to financial savings, but could also be the first step towards being more engaged with our energy use and our practices in the home. Possibly this could lead to a better public understanding of the wider impacts of these practices on the environment as well. Focusing the message on financial savings can be an effective way to engage people. When it comes to those living in fuel poverty, the most immediate issue is being able to afford a heated home while having money left to feed the family. What happens when the Big Energy Saving Week is over? Is there a place people can turn to if they need advice on saving energy? Community-run energy advice centres, or ‘energy cafés’, are such places. They are usually pop-up shops operating on a temporary basis, filling a gap created by the disappearance of energy advice centres and high-street presence of energy suppliers. They are safe spaces without stigma providing advice in a café setting. 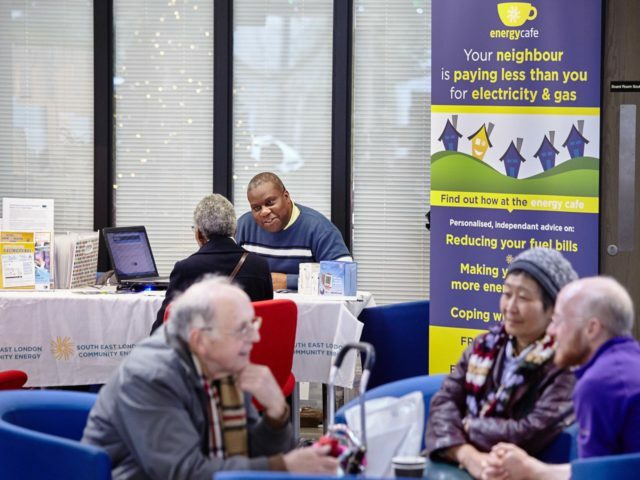 Researchers at the Centre on Innovation and Energy Demand (CIED) together with South East London Community Energy (SELCE), looked at the role of energy cafes in alleviating fuel poverty and found that a large proportion of the clients using this service are in or at risk of fuel poverty. Energy cafes are most effective in helping people engage in the energy market, cope with debt and access The Warm Home Discount. They can also inform consumers about energy efficiency improvements they can make to their home and are effective in identifying vulnerable consumers and referring them on to a home visit. The research shows that energy cafes cost much less to run than the money they save: the combined financial benefits for clients can exceed the cost of delivery of the programme by a factor of three. The Big Energy Saving Week is a welcome initiative. Energy cafes, which can provide a similar service throughout the year, could be a long term solution, but they struggle with funding and they are run by volunteers who sometimes lack skills to provide the right service. ‘The Big Energy Saving Week is a great way to raise consumer awareness around energy and help people in fuel poverty. Energy cafes could provide this service on the longer term, however, In our research we found that more stable funding models are needed to ensure that they can operate on a more permanent basis and in the right locations’. Consumers can be more active players in the energy market by switching suppliers and they can save money that way. They can also make small adjustments to the way they use energy to reduce their consumption. However, to achieve sustained reduction in energy bills, we need to reduce the amount of energy needed to heat homes by improving the efficiency of buildings. For this we have to look beyond consumer power. According to a report published by CIED and the UK Energy Research Centre (UKERC) ‘Unlocking Britain’s First Fuel: The potential for energy savings in UK housing’, improved energy efficiency has helped reduce UK’s total household energy consumption by one fifth since 2004. It has also saved the average dual fuel household £490 in 2015. Despite these benefits, there still remains a large potential in making further energy efficiency improvements. ‘The Clean Growth Strategy shows that the UK government is now committed to energy efficiency in the building sector. As the Committee on Climate Change pointed out, we now need policies to match the ambition and meet our decarbonisation targets while providing affordable energy at the same time’. Consumer action is an important step towards achieving a transition to a low carbon economy but without a coherent and consistent policy mix in place, we are likely to fall short of our climate commitments. The Government’s Clean Growth Strategy set out some ambitious aspirations for improving the energy efficiency of the housing stock, but we are still awaiting the detailed policies that will deliver them in practice. Nora Blascsok is Communications and Engagement Officer at the Centre on Innovation and Energy Demand (CIED). Rosenow, J. , Eyre, N. , Sorrell, S. , Guertler, P. (2017) Unlocking Britain’s First Fuel: The potential for energy savings in UK housing. Martiskainen, M., Heiskanen, E., Speciale, G. (2017) Community energy initiatives to alleviate fuel poverty: the material politics of Energy Cafes. Local Environment 23(1) pp.20-35.